Which fate will we choose for ourselves? Where the heck are the aliens? We’ve sent them a golden record, we’ve looked for signs of them on Mars and to the far reaches of the solar system. We’ve got our ears pressed to the ground, listening for them as best we know how. And still, nothing. One scary prospect: what if they’re all already dead? And climate change was the culprit? That wouldn’t bode well for us — not only because our search for aliens will come up empty, but because of what it may portend for our own future. This is according to a study published May 1 in the journal Astrobiology. A team from the University of Rochester used mathematical models based on a real-life lost civilization to examine how other civilizations, humans or extraterrestrial, may have fared when faced with planet-altering climate change. When thinking about civilizations that doomed themselves, few are better examples than Easter Island. “Easter Island presents a particularly useful example since it is often taken as a lesson for global sustainability,” Adam Frank, the lead author of the study, told Live Science. “Many studies indicate that Easter Island’s inhabitants depleted their resources, leading to starvation and termination of the island’s civilization.” Importantly, Easter Island was a closed system — isolated from larger land masses, the island’s inhabitants didn’t have anywhere else to turn once they ran out of resources where they lived. By creating models of Easter Island’s inhabitants alongside their rapidly depleting natural resources, the research team was able to envision several possible end points for any civilization with limited natural resources (such as ours on Earth). These charts, created by Frank’s team, are a sort of “choose your own adventure” for the fate of civilization. In Scenario A, subtly named “die-off,” the population climbs so rapidly that the environment can no longer sustain life. 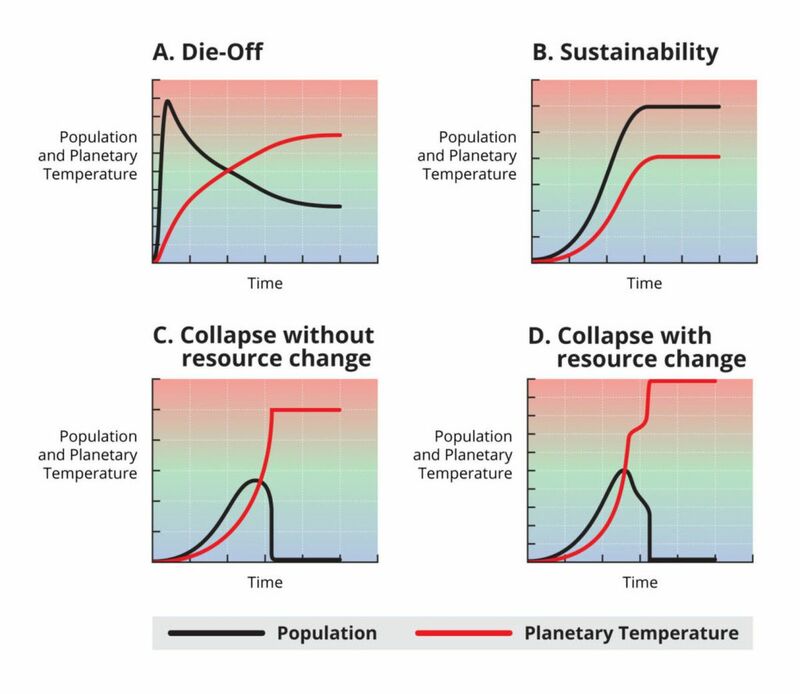 In scenarios C and D, different flavors of “collapse,” growing populations are confronted with steadily rising temperatures. In one case, the civilization continues to grow without adjusting and soon depletes its resources. In the other, the civilization shifts toward sustainability, but the change is too little, too late. Its fate is sealed. Luckily, there’s one situation in which the civilization doesn’t completely collapse. That’s scenario B: sustainability. In this model, a civilization has responded to the threat of climate change by adopting sustainable practices soon enough to save itself. The population levels off without pushing its environment to the point of collapse. Of the four scenarios, we don’t seem to be moving towards the one that would allow our civilization to survive. There are many theories as to why we have yet to find other life forms, including the possibility of a great extinction event every civilization must overcome. 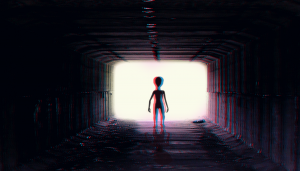 Imagining how alien civilizations may have approached similar global threats might make us better prepared to confront our own. After all, the difference between survival and a grim fate in each scenario? How soon each civilization responded to the impending shortage of resources. “Across cosmic space and time, you’re going to have winners — who managed to see what was going on and figure out a path through it — and losers, who just couldn’t get their act together and their civilization fell by the wayside,” Frank told Live Science.